The need to add value to the deliverables from online searching continues to grow. During recent years, increasingly, information brokers prepare value-added deliverables for corporate information managers and librarians on a contractual or ad hoc, per-project basis. Individuals from various departments in companies of varying sizes and across many industries, as well as business, marketing, and management consultants, also hire information brokers when budgets and deadlines permit the time and expense it takes for this type of work. Furthermore, business units within corporations and organizations employing information specialists or research analysts with library science degrees or MBAs also must produce sharp-looking, effective output. For example, Jena Lund, information specialist (and MBA) at APQC (American Productivity and Quality Center) [http://www.apqc.org], an organization known for benchmarking and best practice studies, conducts research and writes reports for internal and external clients. snapshot/index/0,3517,277,00.html], which provide very brief industry information, names of major players, key organizations and associations, and resources with links. Both Vault and Wetfeet are career-oriented sites and as such depict corporate culture in their company profiles. These profiles are a unique source for providing insights about a company and useful for competitive intelligence projects. Primarily the sites cover large public companies. This Business 2.0 site contains links to various industries and their components (see above screenshot) and includes major players, industry issues, and trade and professional organizations. This fee-based site offers profiles for 125 industries. Each profile costs $99. A database subscription allows unlimited use. This site has links with abstracts of industry sources for several dozen industries. Standard & Poor's Industry Surveys are overviews of 51 major U.S. industries. Reports include industry trends,developments and forecasts, major players and market share data, key ratios and statistics, comparative company analysis, general industry operations, and other information. The surveys are available in both HTML and PDF format on a subscription basis. Individual surveys can be purchased online at http://sandp.ecnext.com either in hard copy or PDF files for $325 each. You can also purchase individual industries, updated twice a year, at a cost for one industry of $500. The complete S&P Industry Surveys product with all 51 industries is available electronically through S&P's electronic venues. A full subscription comes in either weekly or quarterly updates. There are two major benefits that come from the enrichment of deliverables: 1) considerable timesavings for the customer; and 2) the enhancing of customer perceptions of the information center's worth. Value-added deliverables may typically take from 8-50 hours to complete, though some extensive projects, for example, intranet content development, can take hundreds of hours. One project for the marketing department of a large law firm required more than a year to complete. Other projects entail ongoing tracking and monitoring of competitors or industry trends and market statistics essential to strategic planning and business growth. Much of this type of work encompasses company, industry, and topical research and covers areas such as competitive intelligence, market research, or due diligence. Secondary research, consisting of commercial database searching, Internet research, contact with trade associations and experts for source material or knowledge, and telephone research and interviews, may form the research component. 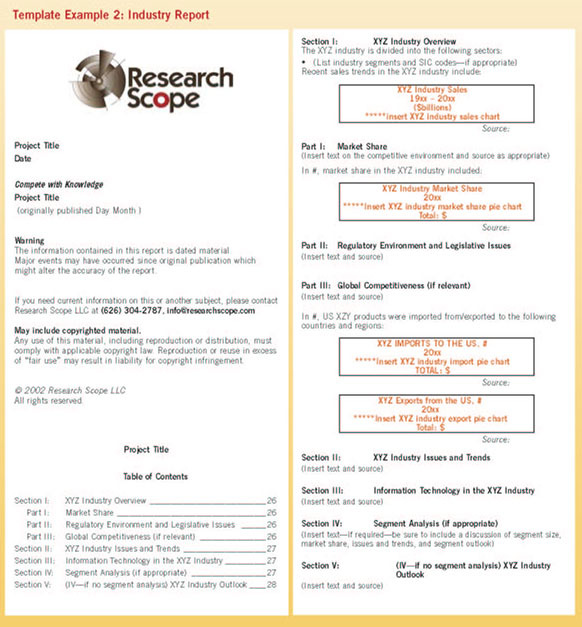 Once complete, research is reviewed, filtered, organized, and synthesized into a written report that succinctly summarizes and further categorizes what has been uncovered during the research process. The final output can answer specific questions, either about companies or industries, or about business management, business processes, marketing and advertising strategies, or trends and forecasts about the future. As an information broker, the majority of my work in the past has involved online research, compiled with information categorized and organized into documents. This work, in itself, is value added compared to the type of work I once did as a public librarian. Turning back the clock 20 years, I initially ripped my Dialog search results from the printer, or opted for high-quality printouts from Dialog's high-speed fancy laser jet printers sent by snail mail within 48 hours. Before giving results to the user, I and other librarians I worked with, checked off or highlighted relevant results, or crossed out extraneous database records with a pencil or a yellow highlight pen: Although messy-looking, this was a key effort in assisting patrons by preventing them from looking at false drops or irrelevant material and was the only value added available at that time. Then came computers and word-processing software. Now one could save results, delete irrelevant information, and create high-quality, easy-to use documents. Working at a public library, however, there was little time and, without computers, just CRTs (cathode ray tubes, i.e., a monitor without computer) and printers, no possibility of serious value-added work. When I started my information brokerage full time in 1984, with the first vanilla IBM computer on my desktop and word-processing software, I began organizing information into sections. Upon the advice of a marketing consultant, I added a table of contents to the compilation of articles every time to help clients find information more quickly. As time went on, I learned that presentation is everything, leading to repeat business, good referrals, and more sales. A high-quality deliverable is much more than pretty. It's functional, because organizing results into an easy-to-use document saves the client time. In one situation, I hired a graphic designer to do an attractive layout of my research results for a client, whose business could provide me with a huge year-long contract. The presentation impressed the prospective client and probably explains how I got the job. Librarians that contract with information brokers supplement existing internal information and research services. There aren't enough hours in a day for most librarians to expend large amounts of time on one request, because of their many and varied responsibilities and sometimes hundreds of requests a month. Still, adding a capability for both in-depth research and value-added reports is one way to showcase the significant value the library or information center contributes to its users. Furthermore, with appropriate metrics in place, a library can track ROI (return on investment) for this kind of service. In today's corporate business environment, decision-makers expect more from the information they use. They are more proficient in their information usage and application, and they don't hesitate to use the Internet to find information for themselves. At the confluence of these trends is value-added research and analysis  a practice that has become the strategic imperative for market research and intelligence professionals. The "information accountability bar" has been raised. In completing a value-added research project, librarians may consider retaining other types of professionals besides outside researchers and information brokers, e.g., marketing analysts, economists, financial analysts, or in-house experts. Many large corporations already maintain contacts with well-known consulting firms. Bringing other consultants and analysts on board for selected projects is a potentially wise decision. Admittedly, consultation with in-house experts for certain requests may not be possible because of the confidentiality that some organizations require to protect internal team efforts. In these instances, outside specialists provide useful services and are a valuable alternative. Telephone researchers with expertise in conducting interviews and eliciting important information for competitive intelligence and market research questions, for example, will often produce answers not available online or from other sources. Using legal and ethical information-gathering techniques, they collect information and insights that lead to more knowledge without divulging their client's name. This can add tremendous value to the final results. Angela Kangiser (Online Business Research, Colorado Springs), a research expert in telephone interviews, says, "Aside from phone research being a necessity in some cases, interviews breathe life and clarity into a project or deliverable." A word of caution regarding telephone interviews: Although there are tremendous benefits, I've also worked with companies which do not want any phone research conducted, fearing it may attract attention that gets back to a competitor. Sensitive situations require careful decisions with regard to various research methodologies. 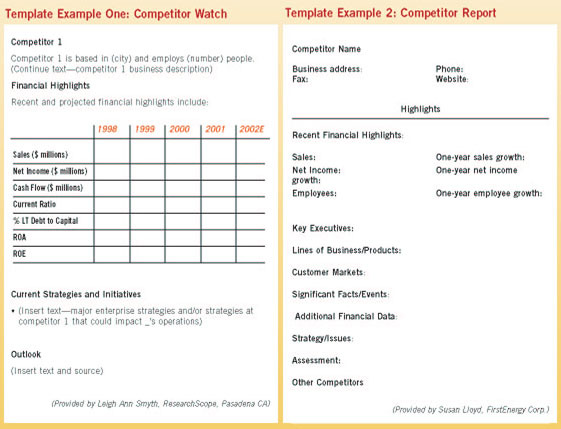 Synthesize raw material into an executive or written report that includes a summary. Outsell, Inc. suggests a different model by asserting that value-add is "the addition of opinion and recommendation based on experiential knowledge that overlays any collection, filtering, or manipulation of the information being provided to its ultimate user. "2 While this is probably the ultimate in value-added work, each level beyond producing and delivering raw data adds value important in developing and delivering value-added products and services. 	There may be inconsistencies in the information because of variations in sources, different points of view, or biases. 	There is more information available for some competitors than others. because of budget or time restrictions. 	The results are a snapshot in time. 	Job opportunities from Web sites are a source of CI and included. Methods differ in preparing value-added deliverables, and so do the tips and guidelines for them. One starts with post-processing to edit and clean up search results when necessary. Post- processing eliminates what the client doesn't need to see, such as system commands captured when using the classic versions of commercial databases. When using Web versions, there may be fewer post-processing steps involved, though some still remain. Jena Lund explains, "What I did figure out is that using either DialogLink or Classic Dialog is the way to go if you're going to format the articles later, or if you need to cut and paste quotes from them. Using a macro in Word, or just the Find and Replace function, you can remove the line breaks or paragraph marks from the end of each line and still maintain the paragraphs. In the Web version, I can't see any way to do that." Articles from Factiva, a completely Web-based system, require little cleanup. A change in fonts and spacing or adding page breaks may be desirable, but you won't have to clean up a file in the same way as with Classic Dialog or Classic LexisNexis when using Record Session On. Record Session On is a "super searcher" technique for capturing whole files (sometimes desirable for maintaining a record of your work) and for avoiding document costs when using a transactional account with the LexisNexis Research Software. Classic systems are still important to many professional searchers because of the greater speed and therefore increased productivity for searchers. As an aside, in the case of LexisNexis, the Classic version is also advantageous because it includes the whole system, whereas licensing issues continue to prevent Nexis.com from offering all data sources. A searcher comfortable and experienced in post-processing techniques can work quickly, though admittedly this is grunt work that some would like to avoid. Each person will want to apply online systems and techniques that work best for them. Variation will stem from differences in styles, types of accounts, amount of time spent on various operations, skill levels, etc. A small detail, but one that has always annoyed me, is the fact that some databases include symbols that are unnecessary or confusing to some clients. I delete parts of records such as CODENS, ISSN numbers, and even descriptors sometimes. Some readers may not want to spend time wrestling with these finicky details, but having done this for years, I work quickly. Post-processing for scientific-technical and medical information, however, is different. One writer points out how "removing certain information  such as an ISSN field, CAS [Chemical Abstracts Services] accession number, or AIAA [American Institute of Aeronautics and Astronautics] report number could result in slower and more expensive document delivery down the line." Additionally, some companies include feedback forms to obtain customer input about their services. A report can also contain recommendations, sometimes popularly called Next Steps. Recommendations may call for additional research or ramifications and opinions. Common delivery formats are print and e-mail. For the most part, how you deliver depends on customer requirements. E-mail is fast and easy and saves trees and time compared to printed reports. Some printed reports are compiled and placed in loose-leave binders with dividers, whereas others are bound with spiral binding and attractive covers. A binding machine is low cost and useful to have around if you deliver a lot of work in print. In some settings, you can call on graphics departments to handle this part of preparing a final product or outsource to copy shops by e-mailing documents to them for final preparation, but only if confidentiality is not a concern. The most typical file types for delivering reports are "documents," i.e., word-processed files, PDF files, and spreadsheets. For some situations, I divide results into two files, one containing the executive summary or report, and the other with the online search results, compiled and organized into sections by pertinent topics or questions asked. For business research, I title the compiled online research "Detailed Findings," which is more descriptive and meaningful to a business user than the terms "online research" or "literature search." The Detailed Findings contain copyrighted articles. For companies that share information or work on teams, it's fine to distribute a written and synthesized report, but only one person may have permission to use the Detailed Findings consisting of copyrighted articles, unless royalty or licensing arrangements have been made. Philosophically, I believe in delivering all supporting information and documents. There are situations, however, in which a well-documented report suffices. Some of my colleagues deliver high-quality reports that cite sources and use footnotes and references. They inform customers that the online research is available upon request. Again, what you do depends on your company's internal workings, polices, and user needs. The phrase "literature search" may still be the best choice for medical, scientific, and technical database research, but the more you use words that mean something to the customer, rather than library jargon, the better chance you have for developing relationships that translate into customer satisfaction and loyalty. When I locate relevant PDF files or other file types on the Web containing supporting documentation, I send these as attachments. Until recently, Webforia reporting software would package all kinds of documents into one file, but its bankruptcy now rules out this interesting software as a means for preparing deliverables. A partial alternative is Catch the Web Solo [http://www.catchtheweb.com], license fee $295. A new version was recently released. The company also provides enterprise-wide licensing. Catch the Web captures complete or partial Web pages, including Flash, PDF, database pages, e-mail, or "any page or document that is viewed in an Internet Explorer Browser," and features include the ability to add yellow highlights and "sticky notes" before capture. Files can be shared with other users. Click on the symbol on the Adobe Acrobat toolbar. Use the cursor and mouse to highlight text or Select All. Paste into another file such as a Word document. You can copy up to a page at a time using this technique. There are also conversion software programs and Adobe provides a Web site that will convert PDF files to HTML or text. See the following URLs for additional information: http://access.adobe.com/simple_form.html and http://access.adobe.com/onlinetools.html. Since most of my work is incorporated into reports that clients provide to their clients or used by more than one person, I prefer to prepare document files (e.g., in Word) that are easier for clients to integrate and faster to print than PDFs. Nevertheless, a nifty service introduced by DataStar Web in late 2000 allows users to save documents as RTF, HTML, text, or PDF. When the DataStar Web product manager gave me a demonstration of how to save results in a PDF file, I was in awe of the instantaneously produced document derived from selected articles. The file includes a title page and table of contents, created immediately and automatically. A DataStar enhancement last year added the capability of customizing the title page to a user's specifications. The default cover sheet contains the DataStar/Thomson name and logo. For a one-time fee of $500, Dialog customizes the PDF file cover sheet with your company name and logo. I'm giving serious thought to using DataStar Web for this fast approach to creating attractive value-added research results instantly, that is, when a DataStar database serves my research needs. Of course, if parent company, Dialog, would add the feature to its own data collection.... Enough said? The adage "less is more" applies strongly to value-added deliverables. Learn to prepare reports with short sentences and bullets that concisely summarize research. Avoiding those huge printouts of hundreds of pages is one request that some clients make, although other clients prefer to review all materials and incorporate data into their own reports or analyzes. Adding graphs, tables, or charts also upgrades the overall report and is something that business users value. Using tables is not only functional, but also provides a good finishing touch that adds a very professional look and impresses clients. Learning to craft simple tables and charts in Word and Excel is fairly easy to do. For complex work, consider in-house or outside experts knowledgeable in the use of various tools. Your motto? Whatever it takes to get the job done right. Budgetary issues and costs are important considerations prior to offering value-added products and services. Synthesized, written reports with analysis take time and expertise to complete, and costs are not insignificant when you combine expense for hours incurred and online fees. In library settings, some allocate line items in their budget for internal and outsourced research, including labor and expense. Others use the charge-back method. This can entail cost-recovery and/or profitability requirements. In some cases, organizations charge hourly for labor but subsidize online costs. Variations across businesses and corporations depend on corporate culture and on other internal workings. Since many businesspeople are visual and prefer reports with tables, graphs, and charts, it's great whenever possible to make simple tables quickly from the research you've conducted, or use some already available from a range of sources. Dialog's Report Feature is one way to gather data in tabular format for inclusion in a report. A search on File 516 for the Top 20 Audio and Video Manufacturing Companies using the report feature, for example, took me 1 minute at a cost under $15 [see tables 1 and 2 on pages 48]. Apart from creating a table this way, research on the Web frequently locates ready-made tables in HTML that you can cut and paste into a document. Internet Explorer retains tables, whereas the older, and oft-favored, Netscape versions lose the tabular format when copied into a text document. You can also save time on making tables or charts by using online database systems such as Alacra, LIVEDGAR, InfotechTrends, and OneSource, all of which allow you to export business and financial tabular data into spreadsheets. PriceWaterhouseCoopers' EdgarScan [http://edgarscan.tc.pw.com/EdgarScan] provides software for instantly generating graphs from tabular information, useful in benchmarking financial data. At the site, enter a company's name for links to relevant portions of current EDGAR filings. Then use the EdgarScan Benchmarking Assistant. A powerful formatting tool for greatly enhancing the appearance of the information you retrieve. Benefits include: 1) hand's free chart creation of tabular reports, 2) tables created in seconds that would take hours or days by hand, 3) information of interest extracted into tabular cells from raw text, and 4) data structured for easier understanding and presentation. When time is short or the budget small, look to ready-made or ready-to-go (AKA packaged or pre-packaged) company and industry reports. You may be able to quickly locate the reports you require without conducting extensive research. Much of my work involves finding answers to specific questions, uncovering industry information on narrow market segments or niches not covered by existing sources, or in-depth and thorough research on companies. Nevertheless, there are instances where ready-made reports are adequate for a request. When there is more than one report on a subject, you may need to synthesize reports, but when time and budget kick in as factors, sending packaged reports can save the day. I received a request for 15 company profiles the client wanted delivered within 24-hours. I used Hoover's and MarketGuide (Multex), for most of the companies, and each complemented the other. Supplying more than one source whenever possible is good practice for confirming or verifying data or providing different perspectives. In other situations, sections or pages from market research and investment analyst's reports (available from Profound, Dialog, LexisNexis, Research Bank Web or Intelligence Data, etc.) may suffice for clients who need analytical information immediately. 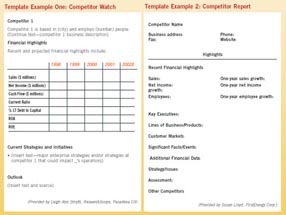 You can design templates in Word or tailor a report to a client's requirements using topics based on the questions asked and information you locate. 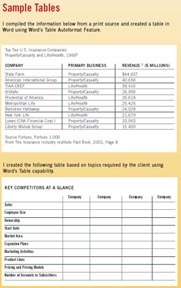 Consult tables of contents from market research, consulting firm, or investment analyst's reports as sources for ideas about how to model your reports. 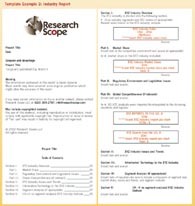 Market research sites such as Marketresearch.com and Mindbranch.com contain abstracts and tables of contents for thousands of reports. Large consulting firms provide many free reports downloadable from their Web sites, and tables of contents from Investext are available from Research Bank Web, Intelligence Data, Dialog, Profound, LexisNexis, and DataStar. Several examples of templates were generously supplied by independent information professionals and a special librarian. 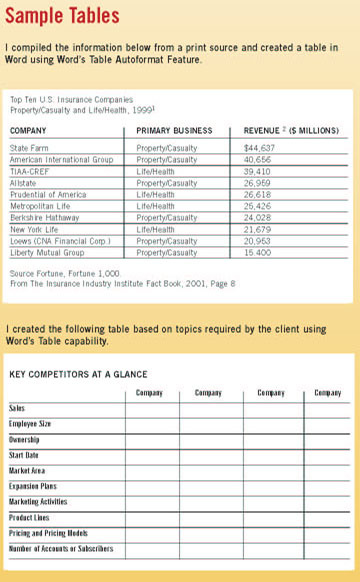 I've included samples of tables I've created as well as checklists of what to include in company and industry reports. Customize reports according to client needs. Use sources that save time. Value-added deliverables take hours to prepare but the pay off is BIG. When creating value-added deliverables, establish guidelines or policies. Only interpret data or make recommendations when expertise permits. Use internal or outside sources for a more advanced end product. A final word: Value-added deliverables incorporate the skills and knowledge that many information professionals already possess related to analysis, summarization, and synthesis. But if additional training becomes necessary, I hope this article provides food for thought about additional education, both at the graduate level and for future continuing-education programs. What Roles Should Information Professionals Play? 1. Analyze: To study or examine [something] in detail, in order to discover more about it. 2. Summarize: To express the most important facts or characteristics about [something] in a short and clear form. 3. Synthesize: The mixing of different ideas, influences, or things to make a whole which is different or new. 4. Interpret: To decide what the intended meaning of [something] is. 5. Recommend: To suggest that [someone or something] would be good or suitable for a particular job or purpose, or to suggest that [a particular action] should be done. The successful candidate would join a dedicated, customer service-oriented team providing timely, value-added information. Duties: Locate information necessary for the analysis of companies, industries, and market trends. Perform research using a variety of print and electronic resources. Provide excellent customer service in both the reference interview and the presentation of information. Market the Information Resource Center's services to internal clients and take part in initiatives to improve service. Qualifications are a Master's Degree in Library Science or equivalent research experience required with successful applicants also strong in database and computer skills, including experience with LexisNexis, SDC, Web-based applications, and Microsoft Office. Excellent organizational and communication skills required. Whereas 15 or more years ago, some continuing-education courses for librarians centered on online database skills as a key focus, today, many librarians learn and hone other skills to fulfill the requirements described above, for which, currently, graduate-level library and information science education or other continuing-education venues may offer minimal groundwork. Value-added deliverables fall into the realm of dissemination of information, a traditional library role, but they require additional skills that encompass critical thinking and writing and communication proficiency. Critical thinking recognizes: 1) patterns and provides a way to use those patterns to solve a problem or answer a question; 2) errors in logic, reasoning, or the thought process; 3) the identification of irrelevant or extraneous information; 4) critical analysis of preconceptions, bias, values, and the way that these affect our thinking [Critical Thinking and Information Literacy (CTILAC), http://ir.bcc.ctc.edu/library/ilac/critdef.htm]. Although many librarians already have these skills, preparing value-added deliverables is nevertheless a revolution in the way we conduct business and a major break from the past, with implications for changing job roles and enhanced professional image. Concerns about just how far you can  and should  go must be addressed. Ideally, you should establish clear polices about what you can and cannot do and add disclaimers to your work. Official disclaimers may require consultation with legal counsel. Minimally, you must consider the issues and prepare to discuss them with clients. Offering value-added deliverables does not mean going out on a limb to interpret data or make recommendations about subjects you know little or nothing about. One librarian who provides value-added deliverables explains that her company has no written policies, but expects them to set stopping points based on their comfort levels. She conducts research, synthesizes results, and provides opinions about what she finds or doesn't find. Her results consist of a summarization and analysis. When answers are not found, if she has an idea about why the information is not available, she may venture an opinion because of her knowledge of sources. To her, value-added deliverables are notabout telling the customer how to use the information or apply it, or how to make a business decision. She points out that it's important to consider where the info pro stops and the customer starts. End-users may be mired in a subject area, but they certainly don't know everything. When clients request information, they consider the results provided by the library as one source or data point because, frequently, they pull information from other sources such as internal experts within the company or through talking to industry experts on their own. The research provided by the library is not considered the "be all" source. In one case, for example, a customer may look at competitive technologies and examine four or five products. They request research from patent literature and market size, but may more highly value the results of talking to internal team members about the technologies in question. Whereas they may use secondary research and a report or overview of results as one source, reading between the lines is something the user must do to round things out. Frequently, I receive requests for names and information about major players. But what goes into making a decision about which companies to cover in my research or report? Making such decisions could be potentially risky business. At the same time, through experience as a business researcher, I'm familiar with objective criteria, such as finding information about market share, for example, that can help the client to make such determinations. During the client or reference interview, one must assess the user's requirements and clearly establish whether the requirements lie within the scope of services offered, available sources, and the skills you possess. If clients require information outside a pre-defined sphere, draw lines about what you can and cannot do prior to conducting work, or alternatively, consider retaining outside professionals. I'm a believer in strong verbal communication before beginning a project. Good interviews are a way to offset future potential problems and I consider them as important, if not more so, than written statements found in contracts conjuring up legal obligations or threats. Explicitly describe what you can or cannot do and the formats you will deliver to manage customer expectations. Those conducting public records, trademark, patent, or medical research may need to seek an attorney's advice regarding legal liability. For public records researchers, interpretation of data may violate the law. Whereas private investigators analyze results and report them to clients, public records researchers must be clear about federal, state, and local laws regulating what they can or cannot do. Providing just the documents, as is, without added interpretation, is a general rule of thumb in this field. Excellent communications, together with written polices and disclaimers and knowledge of legal and regulatory issues, are required as part of developing value-added deliverable product and services. Some libraries use forms. The client writes out the request on a form or the researcher interviews and fills out the form. A template covers the question, the requirements, goals, and applications of the research, what the user knows or doesn't know, sources used, and those recommended. Other search parameters include date ranges and languages. After reviewing the request, the researcher interviews the client to clarify uncertain aspects or explain potential limitations. Information brokers and other consultants typically prepare proposals for large or complex projects that contain a restatement of the question with research goals, methodology to be used, budget and terms, deliverable date, format, and applicable caveats or disclaimers. The client reviews the proposal and has the opportunity to ask questions before the project proceeds. For those who establish budgets prior to work, a statement about possible adjustments before beginning is a valuable addition. I include the following statement in my proposals: "This quote is good for 45 days. MarketingBase reserves the right to reevaluate and propose a new budget based on additional or different work requirements." When talking to clients, as appropriate, you may need to explain the limitations of the technology, of particular databases you will use, or of issues surrounding Internet research. For telephone research, explain that good results depend on whether you can reach the right people or elicit the information required, which can be particularly difficult when working in competitive intelligence situations in which customers often want what turns out to be proprietary information. Also clarify issues related to inherent problems with various research methodologies. Explain, for example, that finding answers depends first on whether the data exists, or just as important, whether one has sufficient time and budget to look for the information in all potential sources. Sometimes your budget and turn-around time are so limited, you just cannot answer all the questions or thoroughly search and review all sources. 1	Outsell, Inc. The Changing Role of the Information Professional 2001: Implications for Vendors, Buyers and Users of Content in the Corporate Marketplace. Information Briefing, Volume 4, Number 29, July 25, 2001. 2	Outsell, Inc. How-To's and Best Practices for Creating Value-Added Research and Analysis. Information Briefing, Volume 4, Number 48, October 11, 2001. 3	Sisler, Paul, and Cooper, Linda. Post-Processing Search Results at Teltech, ONLINE, November 1, 1996, Volume 20, Number 6, p. 9. Amelia Kassel is president of MarketingBase, a firm specializing in market research, competitive intelligence, and worldwide business information since 1984. She provides information and library consulting and training, and combines an in-depth knowledge of information sources and electronic databases with expertise in business and marketing strategies. She has an MLS from the University of California­Los Angeles. Her e-mail address is amelia@marketingbase.com.